Most of the individual investors have opportunity to invest in few asset classes, which includes Businesses, bonds. commodities and Real Estate. The stock exchange provides easy access to investors so that they can buy part ownership of businesses a.k.a. stocks or a basket of stocks, bonds or commodities through ETF’s, Index funds or mutual funds. However in case of real estate many individual investors have the ability and access to own properties rather than invest through stock exchange. One can also invest in Real Estate by owning shares of Real Estate Investment Trust. So which is a better investment? before one can answer that question, it is important to understand what are REIT’s and how they operate. I have shared my notes below, if you are curious read on and let me know your thoughts. I recommend “The Intelligent REIT Investor by Stephanie Krewson-Kelly and R. Brad Thomas. I found this book very useful during my research. The Real Estate Investment Trust Act of 1960 legislation that created the REIT structure exempts companies that qualify as REITs from paying corporate income tax, provided they satisfy specific criteria, one of the most notable criteria being the distribution of their taxable income as dividends. The income is what is reported to Internal Revenue Service (IRS) and not what is reported to Security Exchange Commision (SEC) or GAAP income. 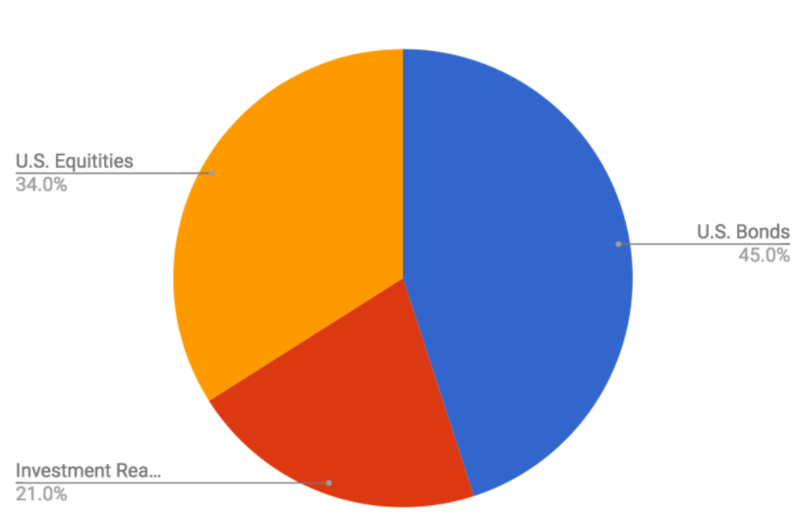 #1 Equity REITs : Derive majority of their revenue from rents paid by tenants according to the terms of lease and use debt to finance the purchase of properties. The debt can be mortgage (also known as property-level debt) or corporate-level bonds (also known as senior or unsecured debt). 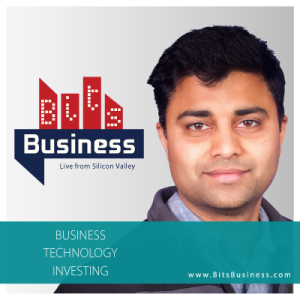 These REIT’s usually have fee simple structure i.e. The buyer receives title to land and improvements, including building and any structures on the land. Sometimes REITs also own properties according to a leasehold interest, which is also called a ground lease. In this case the REIT does not own the land on which the buildings sit, The REIT pays landowner monthly or quarterly fee for the privilege to use the land. 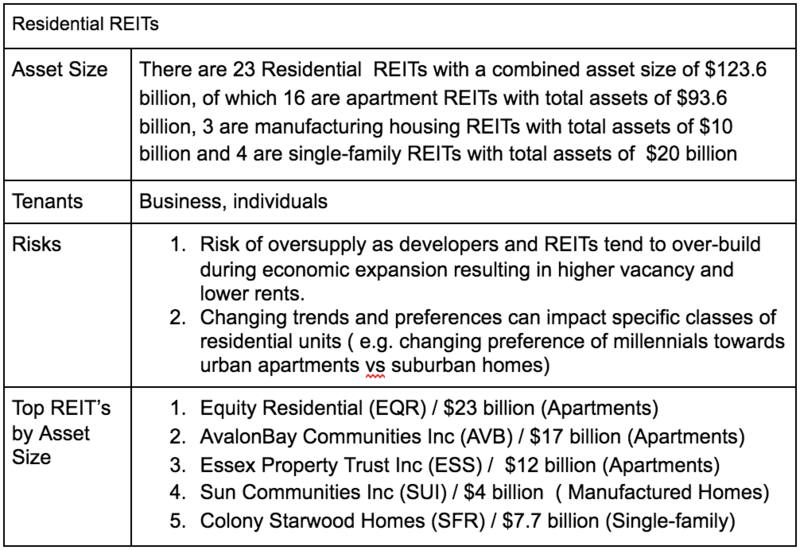 There are many types of equity REITs based on the type of property they own, including traditional properties such as offices, apartments, health and wellness centers, public storage, shipping centers, retail etc and non-traditional properties (also known as specialty REITs) include cell phone towers, timber lands, gas and electricity transmission lines. For rest of the post I will focus on Equity REITs. Income is one of the primary reasons to invest in REITs. FTSE NAREIT All Equity REITs yield was at 3.83% as of July 2017, 10-year treasury yield was 2.26% and S&P 500 dividend yield was at 1.87%. REITs are an attractive investment for investors seeking current income provided it has conservatively leveraged balance sheet and well-located assets that are competitively managed. Total Returns: Equity REITs delivered average total annual returns of 12% from 1972 to 2015 — or 170 basis points more than the 10.3% total return achieved by stocks in the S&P 500 index over the same period. U.S. investment real estate (which excludes single-family homes) is estimated to represent $17 trillion, or 21 percent of the $79 trillion investable assets in the United States. Equity REITs rent their properties to tenants according to leases, the terms of which tend to protect the REITs’ margins from the effects of inflation. Most leases relieves the landlord from various costs of operating a property such as utilities, landscaping, insurance etc. This insulates the landlord from increases in operational costs (i.e. inflation) .Most leases are typically have one-year term, which enables the landlord to increase the rents to keep pace with inflation. Publicly traded REITs offer investors the ability to add real estate to their portfolios without including the liquidity risk that accompanies direct real estate investment. Lease is a legal agreement between the landlord and tenant. There are four major types of leases, each type of lease allocates different costs to the landlord or tenant and determines which party bears the risk of paying higher costs if utility or other expenses increase. 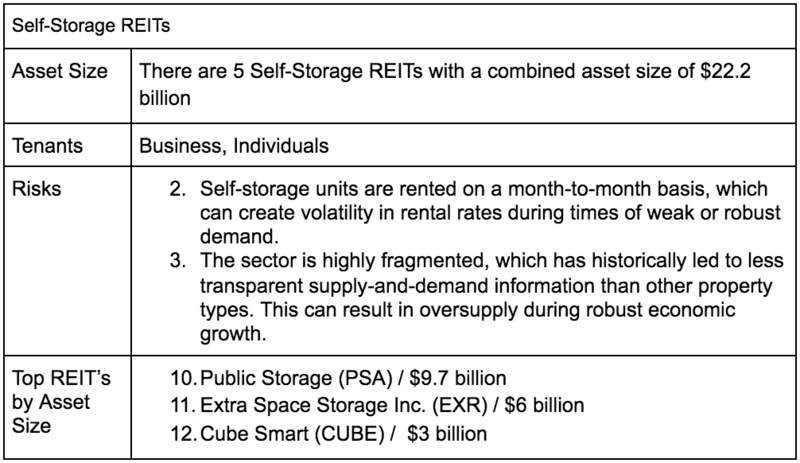 Lease length and structure therefore are fundamental predictors of REIT’s performance. Base Year : 12 months of a lease of the period that with the first full calendar year of a lease. Common Area maintenance (CAM): maintenance expense of common facilities in multi-tenant properties. Escalation clauses: Set future increases in rent that the tenant agrees to pay during the course of a lease. Leasing commissions: commissions paid to brokers, usually 2 to 8 percent of the total rent payable for the initial term of the lease by the landlord to the brokers. Operating expenses: Costs associated with operating and maintaining rented properties, including real estate taxes, property insurance, utilities, and janitorial services for tenant specific areas and excluding interest payments for the mortgage. Market rent: comparable rents for similar property in the market. Gross square feet: Buildings total constructed area to the outside of its walls, considered when the tenant leases the entire property. Rentable Square feet: Tenant’s usable area + share of common area in case of multi-tenant properties. Usable square feet: Amount of space that can be used by tenants within their rented space. REIT’s can be classified based on the type of properties they own. The financial prospects of a REIT depends on the type of property(s) they own significantly apart from the effectiveness of the management. REIT’s that own a specific type of property are known as “Speciality” REITs, whereas “Diversified” REIT’s own multiple types of properties. 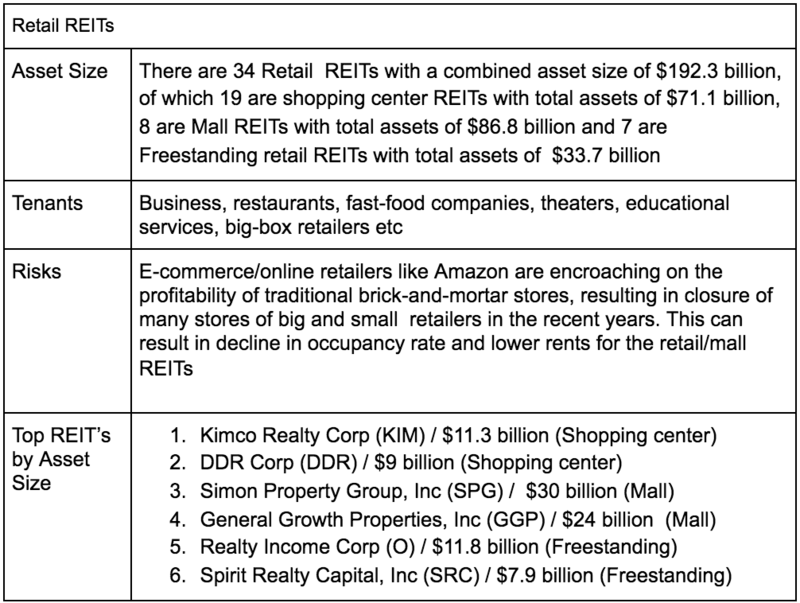 Below is some of the popular commercial real estate types (some of the REITs might own more than one type of real estate property type).Apart from the below mentioned types, there are many more including Cell towers, oil and energy pipelines etc. Healthcare REITs will be an interesting subsector to watch as Americans age and healthcare costs continue to climb. Healthcare REITs invest in the real estate of hospitals, medical centers, nursing facilities and retirement homes. The success of this real estate is directly tied to the healthcare system. A majority of the operators of these facilities rely on occupancy fees, Medicare and Medicaid reimbursements as well as private pay. The majority of U.S. hotels are affiliated with national or international franchises or brands. REITs generally own hotels branded under the most widely recognized companies and tend to focus on the urban markers. Popular brands include Marriott international, Hilton group, InterContinental Hotels etc. The hotel REITs must retain a third-party hotel manager to operate its hotels. The third-party hotel manager is in charge of all operating facets of the hotel, including hiring and managing the employees, revenue management, and maintenance, in exchange the third-party manager receives a base management fee (typically 2 to 4 percent of the hotel revenues) plus profit incentives. 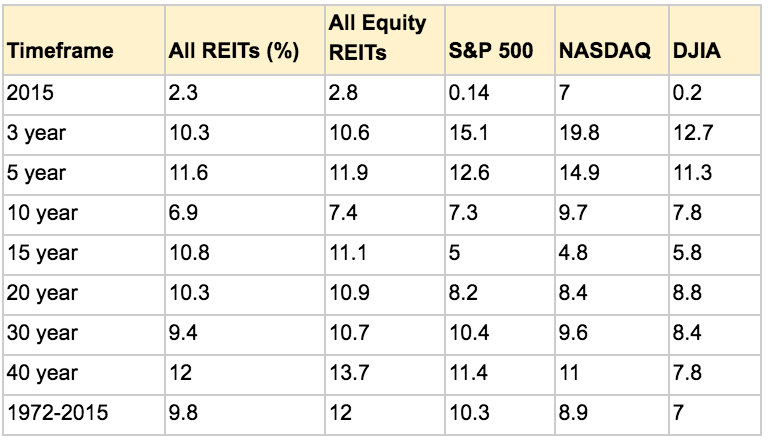 Hotel REITs tend to be the least interest rate sensitive class of investment real estate. Office REITs own everything from high-rise buildings in major metro areas such as New York City, to low ad mid-rise suburban office space in secondary office markets. 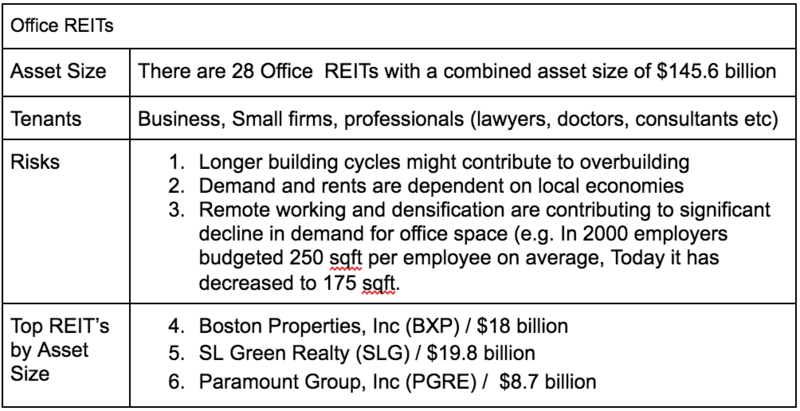 The rent of the office buildings depend on the location, local economy and class of the building. Office buildings are classified based on building quality, condition of their mechanical and other internal systems, amenities ( such as gym and restaurants etc). Newer buildings with good quality systems and amenities are usually classified as Class-A buildings, while older buildings with less efficient mechanical systems and electrical systems (elevators etc), or that are simply less aesthetically pleasing, tend to be classified as Class-B or Class-C. There are three subcategories of residential REITs: apartments (or multifamily), manufactured homes and single-family homes. The demand for all categories of residential units are closely correlated to economy and specifically jobs. Residential REITs tend to have stable income even in recessions as residential units are a necessity. During economic slowdown, rents tend to fall, but demand remains steady as many dispose their homes and move to rental units. Residential apartments and single-family homes are also classified as Class-A, B and C based on the condition of the buildings. There are three subcategories of Retail REITs:shopping centers, Mall and freestanding retail. Retail REITs tend to have significantly longer lease terms. The shopping center encompasses a range of formats, from grocery store-anchored neighborhood and community centers to power centers. Shopping centers typically range in size from 30,000 to 150,000 sqft. Neighbourhood and community centers are among the most defensive property types because, if they are well located, they remain well leased regardless of broader economic trends. Anchor tenants at shopping centers generally are grocery or drugstores, designed to draw traffic to the centers. Malls are classified as regional or super-regional, depending on how large they are and what population base they serve. Regional malls are generally between 400,000 and 800,000 sqft in size and have at least two anchor tenants. Malls are also classified as Class-A, B or C depending on the quality of the buildings and their location. Shopping centers and Malls usually use a full-service or gross-modified lease. Freestanding retail properties house a wide array of businesses, including fast-food and sit-down restaurants (such as Burger King and Macaroni Grill) , drugstore, movie theaters, day-care services, automotive care and gas stations. REITs that own freestanding retail properties typically use triple-net leases with their tenants. By using triple-net leases, the tenants have full control over their property operations, including staying open late or all night for business. Industrial properties are leased to business for a variety of purposes, including distribution warehousing, light manufacturing and R&D. Industrial property is among the most stable, least-volatile asset classes in the United States. The occupancy rates are usually highest among the REITs at 88-92% due to the multi-decade lease terms. The risk of over-supply is low as the sector is well organized new construction tend to follow the demand. Demand for industrial properties is correlated to consumer spending and growth in the country’s GDP. 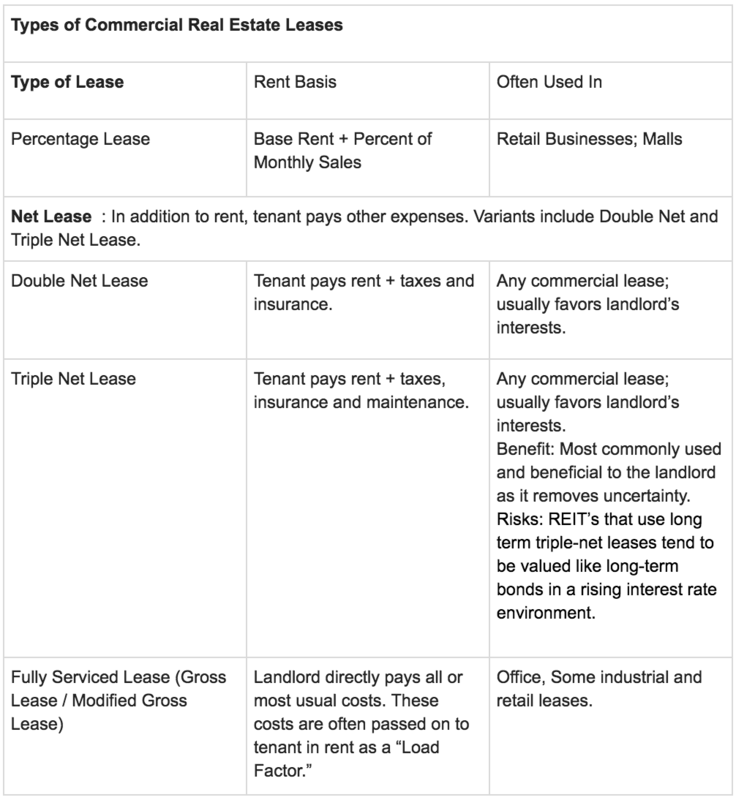 Industrial REITs usually employ triple-net or modified-gross leases.